Devaluation I. 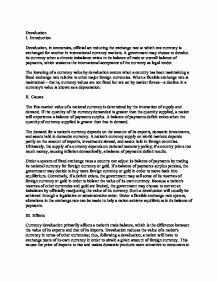 Introduction Devaluation, in economics, official act reducing the exchange rate at which one currency is exchanged for another in international currency markets. A government may choose to devalue its currency when a chronic imbalance exists in its balance of trade or overall balance of payments, which weakens the international acceptance of the currency as legal tender. The lowering of a currency value by devaluation occurs when a country has been maintaining a fixed exchange rate relative to other major foreign currencies. When a flexible exchange rate is maintained-that is, currency values are not fixed but are set by market forces-a decline in a currency's value is known as a depreciation. II. Causes The free-market value of a national currency is determined by the interaction of supply and demand. If the quantity of the currency demanded is greater than the quantity supplied, a nation will experience a balance of payments surplus. A balance of payments deficit exists when the quantity of currency supplied is greater than that in demand. ...read more. III. Effects Currency devaluation primarily affects a nation's trade balance, which is the difference between the value of its exports and that of its imports. 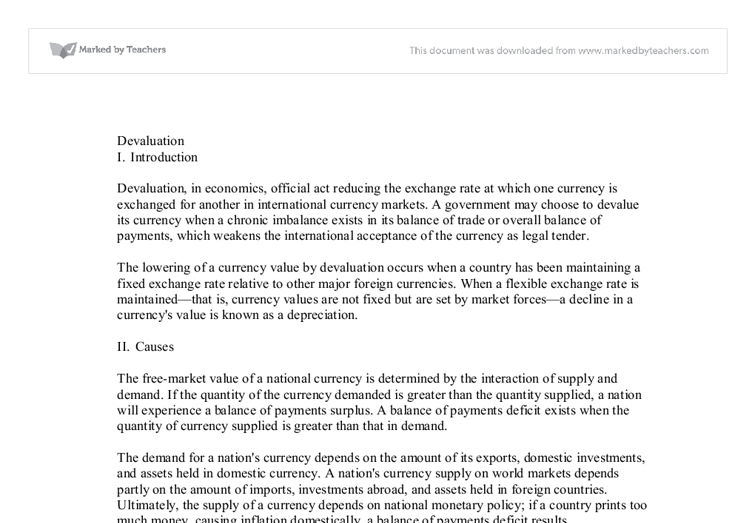 Devaluation reduces the value of a nation's currency in terms of other currencies; thus, following a devaluation, a nation will have to exchange more of its own currency in order to obtain a given amount of foreign currency. This causes the price of imports to rise and makes domestic products more attractive to consumers at home. Because it takes less foreign currency to buy a given amount of a devalued currency, the price of the nation's exports declines, making them more desirable to foreign consumers. Depending on consumer and producer responsiveness to price changes (known as supply and demand elasticities), an effective devaluation should reduce a nation's imports and raise world demand for its exports. Improvement in a country's balance of trade will cause an increase in the new inflow of foreign currency; this, in turn, may help strengthen a country's overall balance of payments account. ...read more. An agreement was also reached to set upper and lower limits within which exchange-rate fluctuations were permitted in response to market conditions. At the time of the conference this limit was set by the IMF at 1 per cent in either direction. If a country chose to adjust the value of its currency beyond 1 per cent, the nation would have to change its currency value officially in terms of US dollars. Although the Bretton Woods agreement enabled countries to raise their currency values, in practice almost all currency changes since then have been devaluations. The British pound sterling, for example, was devalued in 1949 and again in 1967. In the years following the Bretton Woods agreement, the US dollar emerged as the world's leading currency. It was used as an alternative to gold when handling international payment imbalances. In a sense the US dollar functioned as the world's money because it served as a unit of account, a medium of exchange, and a store of value. Other nations kept large proportions of their international monetary reserves in dollars. ...read more. This essay is excellent as far as it goes. Fixed exchange rates are unlikely to return in the forseeable future so I would have preferred to see more discussion of the floating exchange rate situation. This can cause an increase in overall production and/or efficiency. Given this, a drawback would occur if the government failed to clearly identify the method of infrastructure it needs from the private sector. An over or under production can have a ripple effect causing an imbalance in the cycle of production. order for every citizen to afford the good, every citizen to have the right of employment and wages are set by the government rather than by separate firms. Centrally Planned Economy's were primarily a feature of "communist" countries mostly located i Eastern Europe (Soviet Union). Moreover, in some cases it is important to take into account large one-off purchases, especially if we are just looking at the CAD result for one three month period, like Qantas's purchase of Boeing 747's in the December 2002 quarter. Note: The reason that Salomon were confident that this could be done is described as follows: 1. There was a recent deregulation of deposit markets had allowed deposit institutions to offer new variable rate money market deposit accounts. 2. As result of these new offerings large thrift institutions Rabobank: Rabobank had AAA debt ratings, and assets exceeding $42.0 billion. It is based on the Keynesian school of thought and that economic growth is linked with economic development as a country would gain extra income and hence higher standards of living and investment in vital services. In 1936 John Maynard Keynes broke from the classical tradition with the publication of the 'General Theory of Employment, Interest and Money'. lubricants including oil, and semi-manufactured goods, such as steel bars, and then turned these into manufactured goods, some of which then get exported. Britain was a major exporter of oil up to 1985 as it made up more than 20% of their exports, but later fell back to 7% by 1991. The group now has over 400 stores and is continuing to grow. We inspire our people to reach for higher levels of performance. To achieve these standards we only recruit the best. All employees are highly skilled, self motivated and in constant pursuit of perfection.